Portuguese toy designer Marco Fernandes reuses parts from computers, televisions, DVD players, stereos, old toys and other old electronics to build unique robot toys, all by improvising with what he has. 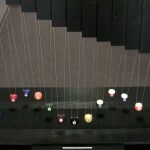 The R³bots light up and come with a display case created from jars, old lamps, plastic boxes and other assorted parts. In the archives: art from found beach plastic.